After analyzing HoneyDNA test results from 84 million bees, we know urban habitats are more bee-friendly than suburban and rural areas. Noah Wilson-Rich, our Chief Science Officer, presented the findings to the TEDxProvincetown audience in 2018. The implications of the study go beyond just understanding where bees find adequate biodiversity. 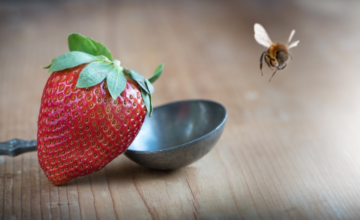 Bees directly impact the stability of our food system. HoneyDNA analysis gives us a baseline measure of any local habitat. It serves as a blueprint that’s critical for urban planning, rebuilding after a natural disaster, and even exploring the potential of supporting human life on other planets. The editors of TED.com found Noah’s message to be an idea worth sharing. They decided to boost our rally cry for more beehive data by featuring it on their global platform. It’s now live on TED.com and Youtube—we’re bursting with pride. We work hard to stay focused on making a tangible impact on the health of bees, and it’s only with the support of our clients and partners that we are able to pursue our mission. Thank you and congratulations on achieving this moment with us!